Fill your patio with Mediterranean trumpet flowers. 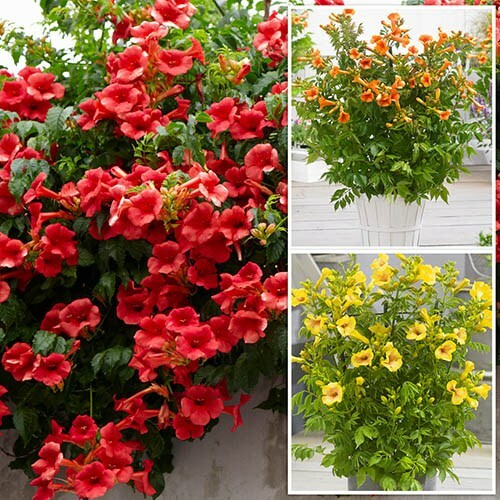 Set your garden alight in summer with our brightly coloured Trumpet Vines. Campsis will flower their socks off in summer well into autumn with bright, vivid displays. The new 'Summer Jazz' series is much more compact, hardier and very easy to grow. They erupt into the magnificent displays you see here - plastered in bold, bright trumpet shaped flowers that bees just adore. Now if you want to set your garden alight in summer, our sensational bright citrus-coloured Trumpet Vines are perfect - they look totally tropical, but are actually very hardy, tough and easy too, but flower their socks off in summer well into autumn with bright, vivid displays. This new 'Summer Jazz' series is the result of new breeeding, which is much more compact at 2m maximum, and hardier and more floriferous - perfect for Brtiish summer gardens. They are called vines, but they do not climb, rather leaning against things! This makes them great for growing against sunny walls, trellises, sheds etc where they can easily be fixed or tied in - as they flower best when exposed to sun for most of the day. They will grow in most soils, apart from very wet, and require little care apart from tying the branches in once a year. In Summer, they erupt into the magnificent displays you see here - plastered in bold, bright trumpet shaped flowers that bees just adore. Widely grown in the continent, you may have seen their bold, usually red displays before, but this new breeding is tougher, hardier, more floriferous, and with stronger, new colours too. Why not plant all 3 along a fence, wall, or shed for a spectacular display or share them with friends if you haven't got space for all 3. But do make sure you give them a go. Grow Campsis against a warm sunny wall and provide shelter from cold winds - they need full sun to ripen the wood if they are to flower freely. Grow outside in any moderately fertile, moist but well-drained soil. Campsis generally need little additional feeding unless they are grown in containers - use a general-purpose fertiliser in early spring. Water new plants until established and water container-grown specimens regularly. If growing in a pot, use a loam based potting compost such as John Innes No 2 or multipurpose compost. Improve drainage by adding extra grit to the mix.